If you are looking into the options of having a bariatric / gastric sleeve or just recently had a procedure, you might have many questions and uncertainties. Your taste buds, food preferences, options as well as dietary requirements all change significantly post-operation. Food becomes one of the most challenging parts of life, and on top of finding support and advice from dietitians, many members find it very helpful listening and reading the experiences of those before them. 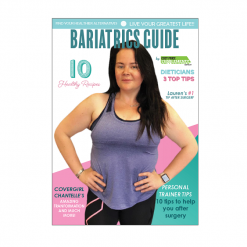 Combining the real-life experiences of many WLS members as well as expert advice from dietitians comes the helpful Bariatrics Guide Book. On top of useful information, you can also expect to find useful tips and tricks for coping after surgery as well as some favourite recipes which we have collected over the years. This simple guidebook will give you some clarity in life after WLS surgery, and through learning about the past experiences of others, it will help you find inspiration to stay on track to a healthier you after surgery.